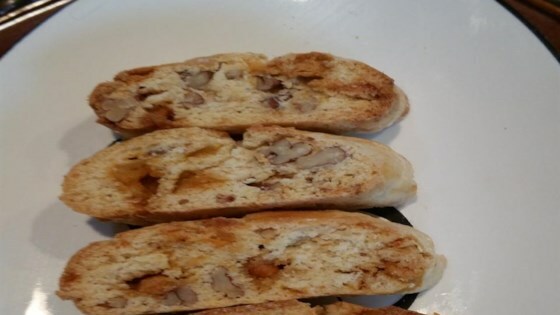 "These biscotti are not too sweet and easy to make. You do not have to use the bourbon but it does give it a little something extra. You can also drizzle melted butterscotch on them, but remember that will make them sweeter." Whisk sugar and 3 eggs together in a large bowl until light and fluffy. Mix in butter, bourbon, and vanilla extract. Sift flour and baking powder together in a small bowl; add to egg mixture and stir until smooth dough forms. Fold in butterscotch chips and pecans. Turn dough out onto a lightly floured work surface; divide into 4 equal pieces. Roll each piece into 2-inch wide by 9-inch long log; place on baking sheet. Brush logs with beaten egg. Bake in preheated oven until pale golden, about 25 minutes. Cool until firm, about 15 minutes. Cut each log diagonally into 1-inch thick slices on a work surface; place slices, cut-side down, on baking sheet. Bake in oven until tops are golden, about 10 minutes. Invert slices and bake until tops are golden, about 10 minutes more.